Her skills might’ve brushed on to me a little bit, since if not wholly, I’m at least half as good as her. What does work in my favour though is having a husband and a child who don’t cringe to play guinea pig to my various experiments! My efforts are given due credit and the deserved appreciation, which is just about enough for me. I’m planning to share few of my recipes with all of you here. There are times when going through endless ingredients and procedures for some recipes bored me enough to find my own new one within it and it has been a complete success. Sometimes I just mixed veggies of my choice and a whole new recipe came out of nowhere. Such and more recipes are going to end up here. 1.Heat oil in a pan and then all the mixed vegetables to it. Saute for a few minutes on medium flame and then add besan to it. 2.Saute till they get mixed properly and then add salt, red chilli powder and aamchoor powder/lemon juice and sugar. 3.Cut the bell peppers through the middle and remove the seeds. Take care that they don’t get cut in two halves. 4.Stuff the mixture prepared in Step 2 in the bell peppers. 5.Shallow fry the stuffed bell peppers on low flame from all sides till they turn brownish. 6.Sprinkle with coriander leaves and serve. Cooking time: 25- 30 minutes. I picked up this recipe online and didn’t mess a lot with it. It is very easy to make and most importantly serves my purpose of avoiding an OTG for baking. Do try this out! 1.Heat pressure cooker with lid on high for 5 mts (without the rubber gasket and whistle). Grease and flour an 8″-9″ inch aluminum baking pan. Keep aside. 2.Sieve flour, baking pwd, baking soda and salt. Add sugar and cardamom powder to the flour mixture and mix. 3.In a bowl, add vegetable oil, buttermilk and mango puree and mix well. Now, add the flour mixture and mix with the wet ingredients. Do not over mix. Gently tap the pan on the kitchen counter once to release any air bubbles. 4.Pour into the prepared aluminum tin. 5.Remove the pressure cooker lid and place a separator at the bottom of the pressure cooker. DO NOT ADD WATER. Using tongs, place the aluminum tin into the pressure cooker. Close lid and on high heat let it cook for 2 mts. 6.Reduce heat to low and cook for 40 mts. Turn off heat and do not open the lid for 5 mts. 7.After 5 mts remove the pressure cooker lid and carefully remove the aluminum pan and cool the cake for 15 mts. Overturn the cake onto a plate and slice. Preparation time: 10 minutes. Baking time: 35 minutes. 1.Heat oil in a pan and add the onion paste to it. Fry till it turns golden brown. 2.Add the carrot and bell peppers and sauté. Cover with a lid and let it get cooked in the steam. 3.Add the mashed potato and mix well. Again cover with a lid for 2-3 minutes. 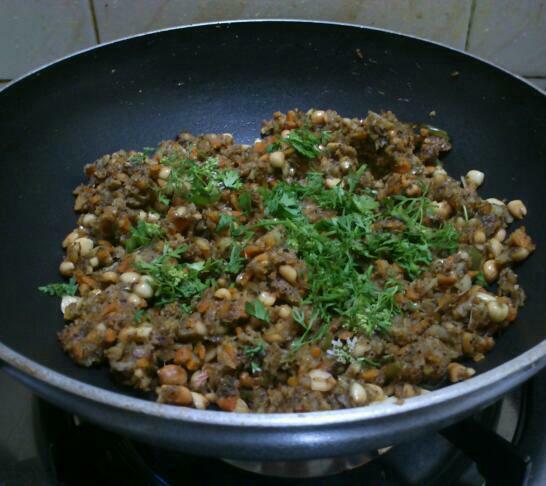 4.Add the groundnuts and all the other ingredients and mix well. Cover for some time. 5.Remove from flame. Garnish with coriander leaves and serve. 1.Heat ghee in a pan and add the soaked rice to it. Sauté for some time. 2.Add milk to the rice and bring it to a boil. While stirring every few minutes let the rice get properly cooked in the milk. 3.Add the kaju powder and dry-fruits. Soak kesar in warm milk for 5 minutes and add it to the milk too. 4.Turn off the flame when the milk has becomes slightly thick. 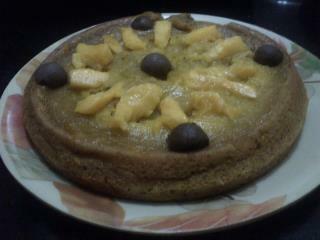 5.Cool the milk and then add the mango pulp to it nicely. Refrigerate. 6.Garnish with few kesar strands. Serve chilled. Lovely…. this dana bharta looks unique…. havnt heard of it…. Oh it is. It tastes very good too and is n’t difficult to make. If you cook you can try it out…or if you don’t you can provide the recipe to someone who can. ???? I love cooking… And I try my hand on it whenever I get time… Wife is happy…???????????????? Oh wow! That’s really good. Try it out then and make your wife happier. ???????? I will try and let you know the results ….???????????? Such a beautiful list. 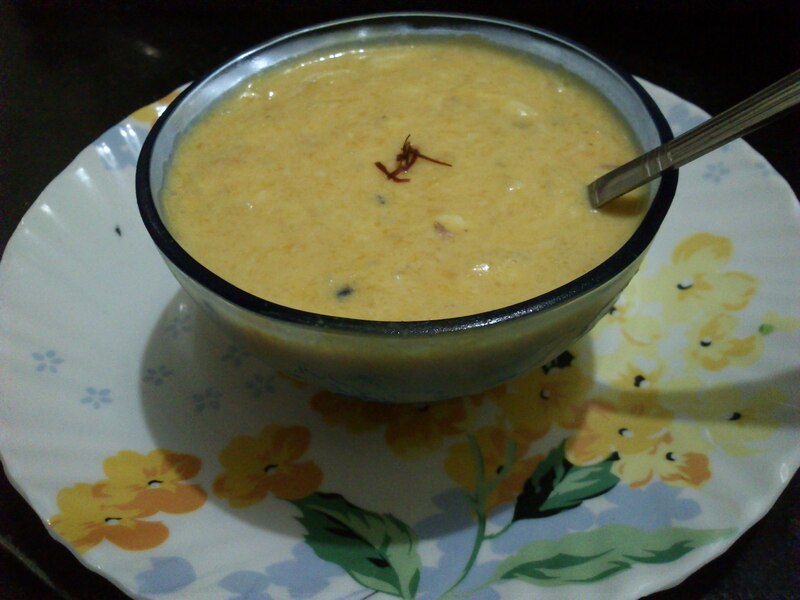 And OMG Mango Kheer. Drools ??? ?